Yesterday was Sunday. It was also 19C. I went for a ride. John and I had some business over near Ventoux around lunch, so we brought our bikes along, trying unsuccessfully not to drink too much wine at our meeting before the ride. We arrived early to check out the village of Mazan, where we have a couple of partner hotels. It was Sunday, but we found at least one place that was open. We are working on a new little tour, too, and we took the opportunity to ride a new road or two. 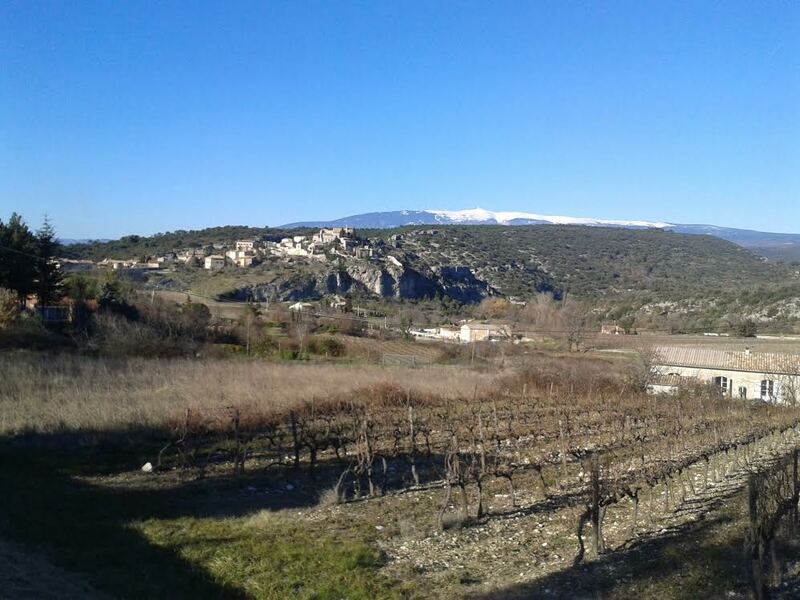 Here’s the first, featuring a stunning view (much better in person, I have to say) of the village of Méthamis, with a snow-capped Mont Ventoux peeking at us in the distance. We are usually pretty good about researching rides, but this time neither of us thought to check what awaited us after leaving Méthamis. The answer is a 12 km climb, which was a bit of a shock to the system for me, even with the gentle gradient we had most of the way up. My first big climb of the season ended below, at another surprise – the Col de la Ligne. 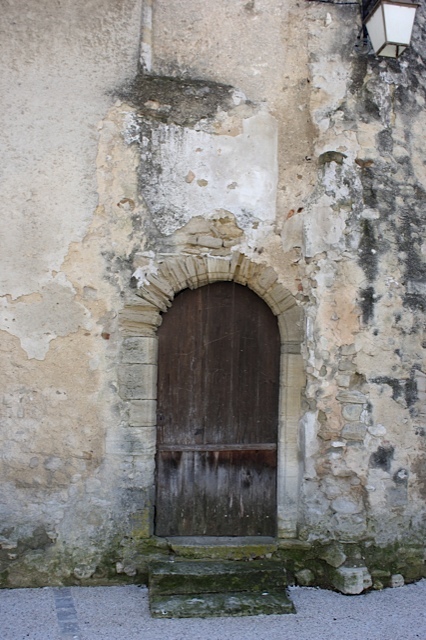 The odd name of the col may be attributed to the Plague Wall (which still exists in places) that was constructed in 1720 to protect the northern part of Provence from Marseilles and the south, where it had broken out. The wall was 27 km long and traversed the length of the little mountain range we climbed over yesterday – the Vaucluse Mountains. The image to the right is fitting, since I nearly hit my own wall on the way up. John, however, cruised up in fine form, and even waited at the top. Your nice weather has made it to Creuse so we’ll be out on our bikes later. 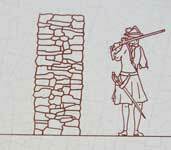 Fascinating about the plague wall. Steph, I’m glad to hear you’re getting a break this winter. I still keep thinking something bad’s going to hit here, but really, it’s been spring all winter! Ohhhhhhh, I remember. We’re again at that time of year when all your posts (don’t take that toooo personally, other sites in Le Sud do the same) elicit inappropriate amounts of envy from me…19C! Bicycle wheels on tarmac! Ventoux! 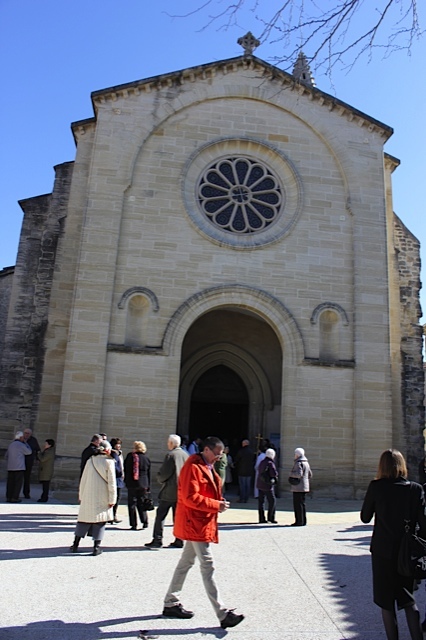 Romanesque churches, extant history! Local red! Ohhhh. Guess I’ll console myself with 48cm of snow, -6C, wheels in the pantry … at least it’s getting warmer. Have a blast …. And the new tour should be great fun! I was thinking the same thing, Suze. It’s gratuitous, I agree, but it has to be done! Happy to see this beauty and be on a virtual escape from 13F this morning in Chicago with another 10 day forecast below freezing. 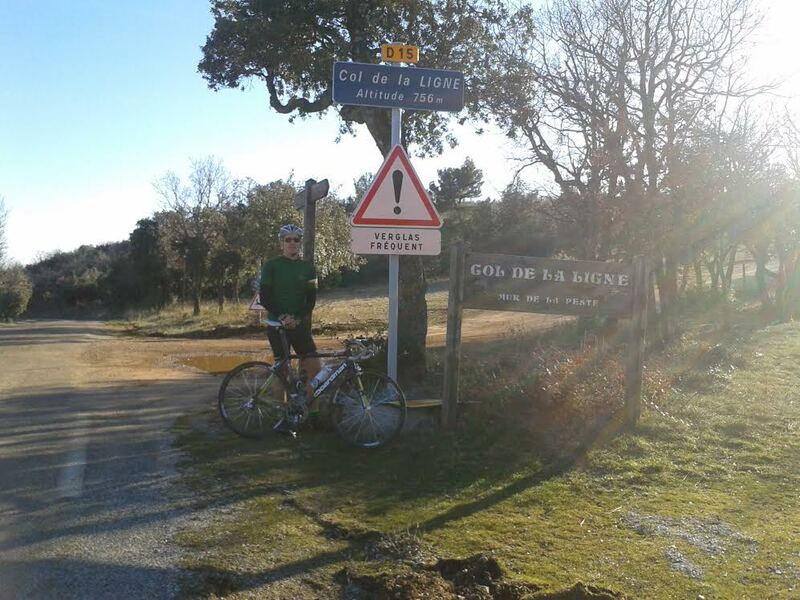 Looking forward to spending time around Ventoux end of July–keep the posts coming so I know where to ride to. You have endless options around Ventoux, Jan. You’re going to be in heaven…and not alone, either, since half your country’s cyclists will be in the same neighborhood! I can’t believe the Belgian season is starting already. I’m going to spark up my Eurosport subscription toute de suite! Glad to see you out and about.